Fix knife_falchion, knife_push and knife_survival_bowie will not count bug. Weapon Stats Update For Old Rankme Webinterface. Add Kill Assist Support And Assist Stats. (Part of code from pracc's rankme, You will get point if you assist kill enemy.). Add Damage stats and DPR. Add New Commnad "topassists", "topmvp", "topdamage" & "toptk". "statsme2" is open for everyone now. Upload smx and translation files to your server. Plugin will auto crate config file "cfg/sourcemod/kento_rankme.cfg". If mysql is not working for you, please check sourcemod extention "dbi.mysql.ext" is working or not. rankme_enabled "1" //Is RankMe enabled? 1 = true 0 = false"
rankme_rankbots "0" //Rank bots? 1 = true 0 = false"
rankme_autopurge "0" //Auto-Purge inactive players? X = Days 0 = Off"
rankme_points_bomb_defused_team "2" //How many points CTs got for defusing the C4?" rankme_points_bomb_defused_player "2" //How many points the CT who defused got additional?" rankme_points_bomb_planted_team "2" //How many points TRs got for planting the C4?" rankme_points_bomb_planted_player "2" //How many points the TR who planted got additional? rankme_points_bomb_exploded_team "2" //How many points TRs got for exploding the C4? 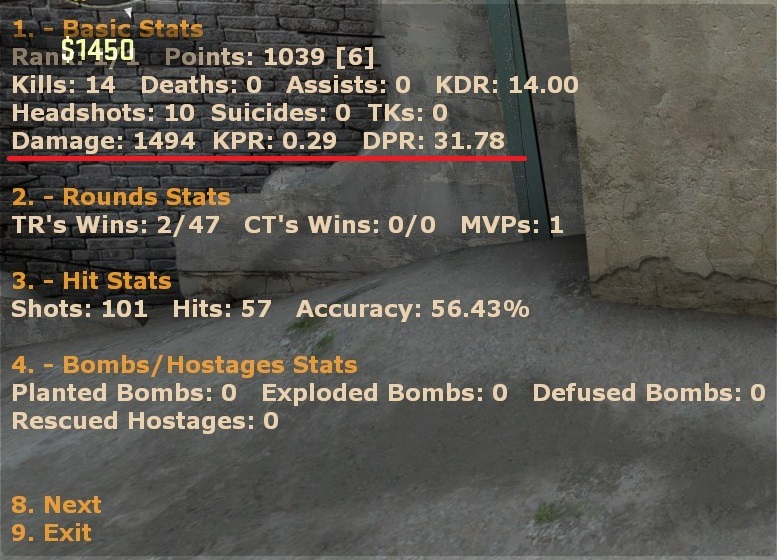 rankme_points_bomb_exploded_player "2" //How many points the TR who planted got additional? rankme_points_hostage_rescued_team "2" //How many points CTs got for rescuing the hostage? rankme_points_hostage_rescued_player "2" //How many points the CT who rescued got additional? rankme_points_hs "1" //How many additional points a player got for a HeadShot? rankme_points_kill_ct "2" //How many points a CT got for killing? rankme_points_kill_tr "2" //How many points a TR got for killing? rankme_points_kill_bonus_ct "1" //How many points a CT got for killing additional by the diffrence of points? rankme_points_kill_bonus_tr "1" //How many points a TR got for killing additional by the diffrence of points? rankme_points_kill_bonus_dif_ct "100" //How many points of diffrence is needed for a CT to got the bonus? rankme_points_kill_bonus_dif_tr "100" //How many points of diffrence is needed for a TR to got the bonus? rankme_points_ct_round_win "0" //How many points CT got for winning the round? rankme_points_tr_round_win "0" //How many points TR got for winning the round? rankme_points_ct_round_lose "0" //How many points CT lost for losing the round? rankme_points_tr_round_lose "0" //How many points TR lost for losing the round? rankme_vip_enabled "0" //Show AS_ maps statiscs (VIP mod) on statsme and session? rankme_points_vip_escaped_team "2" //How many points CTs got helping the VIP to escaping? rankme_points_vip_escaped_player "2" //How many points the VIP got for escaping? rankme_points_vip_killed_team "2" //How many points TRs got for killing the VIP? rankme_points_vip_killed_player "2" //How many points the TR who killed the VIP got additional? rankme_points_lose_tk "0" //How many points a player lose for Team Killing? rankme_points_lose_suicide "0" //How many points a player lose for Suiciding? rankme_points_mvp_ct "1" //How many points a CT got for being the MVP? rankme_points_mvp_tr "1" //How many points a TR got for being the MVP? rankme_points_bomb_pickup "0" //How many points a player gets for picking up the bomb? rankme_points_bomb_dropped "0" //How many points a player loess for dropping the bomb? rankme_points_assiist_kill "1" //How many points a player gets for assist kill? ankme_points_match_win "2" //How many points a player win for winning the match? rankme_points_match_lose "2" //How many points a player loess for losing the match? rankme_points_match_draw "0" //How many points a player win when match draw?" rankme_announcer_player_connect "1" //Announce when a player connect with position and points? rankme_announcer_player_connect_chat "1" //Announce when a player connect at chat? rankme_announcer_player_connect_hint "0" //Announce when a player connect at hintbox? rankme_announcer_player_disconnect "1" //Announce when a player disconnect with position and points? rankme_announcer_top_player_connect "1" //Announce when a top player connect? rankme_announcer_top_pos_player_connect "10" //Max position to announce that a top player connect? rankme_announcer_top_player_connect_chat "1" //Announce when a top player connect at chat? rankme_announcer_top_player_connect_hint "0" //Announce when a top player connect at hintbox? rankme_gather_stats_warmup "1" //Gather Statistics In Warmup? rankme_rank_cache "1" //Get player rank via cache, auto build cache on every OnMapStart. rankme_points_ns "1" //How many additional points a player got for a no scope kill? rankme_points_fb "1" //How many additional points a player got for a First Blood? New cvar "rankme_points_assiist_kill", def "1"
Add new commnad "topassists" & "toptk"
Fix toptk showing assists bug. GOTV bot will not add to database now. Add disconnect reason to disconnect announce. Show damage in statsme & session. Show DPR(Damage Per Round) in statsme & session. Show KPR(Kill Per Round) in statsme & session. Add topmvp & topdamage to !rankme menu. Fix Client is not connected bug. Fix round_ct and round_t will not count bug. Add new cvar "rankme_gather_stats_warmup" to disable stats and points in warmup. Fix "Client is not connected" bug. Now database will be created in "utf8mb4_general_ci"
Fix kdr in !rank will only change after changing map bug. Fix cmd "Invalid client index 0" bug. 3.0.3.Kento.25[LIST][*]New cvar "rankme_rank_cache"[*]Add 3 array to store rank cache. [*]Auto rebuild cache on map start. [*]On get client rank use cache instead of query sql. [*]Thanks Kxnrl. New console command "sm_rankmechat" to disable chat messages. Merge pul request from CrazyHackGUT. Add match stats and points. Fix statsme2 blank chat message. Merged all forks on github. Added new knives in Horizon Case. Fixed match end stats counting and points. Deleted unnecessary web interface update in git repo. Weapon fire will not count knife and grenades now. 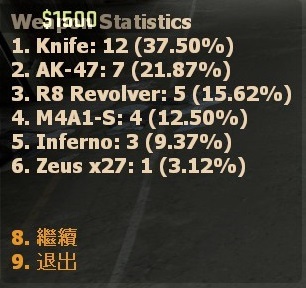 Rewrite knife stats, it should support every knife now. Add first blood and no scope stats. Add new weapon "Breach Charges"
weapon_melee, weapon_axe, weapon_hammer, weapon_spanner and weapon_fists are count as knife. Add round lose points cvars for both teams. Now all players in team will get/lost round win/lose points. Move some code to new include files. Fix reset rank doesn't reset some stats. Fix sqlite unique index query. Remove vip stats? Will CSGO official add vip gamemode in the future? "zho" and "en" phrases are always up to date, if you're using other language, please help me translate the plugin, thanks. lok1 - Developed the original RankMe plugin that this plugin is based on. benscobie - This plugin is improved from his version. pracc - Part of kill assist code is edited from his rankme. TR1D - Thanks for his Russian translation. shanapu - Thanks for his German translation. 2389736818 - Thanks for his Simplified Chinese translation. Kxnrl - Thanks for his rankme cache. anyoneljv - Thanks for his Romanian translation. Elitcky - Thanks for his Spainish translation. CrazyHackGUT - Thanks for his optimization. Last edited by rogeraabbccdd; 04-18-2019 at 10:54. Good job!! the plugin works well. Sorry my friend, I can't understand Russian. Btw, my rankme was created about one year ago, and it was private. Last edited by rogeraabbccdd; 11-04-2016 at 17:37. Last edited by rogeraabbccdd; 11-05-2016 at 08:22.
when new players join the server it show in a other language than english. I think chinees or something like that. How to change that?